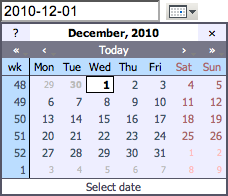 This module packages the Mishoo JSCalendar, a DHTML pop-up calendar in a form suitable for use in TWiki forms and TWiki applications. 10247 TWikibug:Item2054 put the calendar at z-index 2000, way above pattern skin divs. 6634 TWikibug:Item453 removed EditTablePlugins private copy of the Mishoo JS calendar, and made sure it works with JSCalendarContrib. Improved the documentation of the JSCalendar while I was there. Note: Please contribute updates to this topic on TWiki.org at TWiki:TWiki.JSCalendarContrib.